The major work of the evening was the Beethoven 7th Symphony in A minor. The composer himself liked it; Von Weber was amazed at it and this critic considers it one of my favorites. However, from the 2-bar motif of the opening vivace movement to the sonata-form allegro finale, this was only a modest reading. However, the scherzo third was aced and those eight minutes iterating the ABABA theme (ba da dum; ba da dum; Ba da de de dum dum) **[ see notes below] were the second-best part of the entire evening’s program. The boring part of the playbill had to be Omar Daniel’s new work commissioned for the HPO. This horn concerto was obviously written as a demonstration vehicle for conductor Sommerville’s expertise on the instrument. My overall impression was that of a ‘B’-movie background music. It is dull, repetitious with overly pizzicati counterpoint, and moments reminiscent of a Ninja with gastritis! Best I can say, the sponsoring family bought themselves an effective soporific. Now for the great stuff! 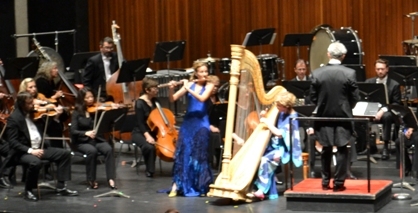 Mozart’s flute & Harp concerto was performed exquisitely by Leslie Newman & Erica Goodman. Their cohesion and almost telepathic empathy melded into what was an utter delight. Newman’s flute predominance in the opening allegro was perfectly balanced by Goodman’s counterpuntal accentuation. The same imagery that filled my mind during the magnificent andantino obviously held the audience spellbound with nary a single philistine applause between movements. The duo obviously cherished each note of the work as an individual gem. This was especially noticeable during the movement’s subtly recurring theme. Enthralled and mesmerized are descriptions that come immediately to mind. This was the first formal concert with Stephen Sitarsky in the concertmaster’s chair. During his brief solo opportunities, we could see both his technical and emotional range. He is a most suitable choice for the position; a worthy asset to the HPO, and a supportive talent for conductor Sommerville. The next concert is a Pops series opener on October 13th, with Basia Bulat; and the second Masterworks presentation will be on November 10th.